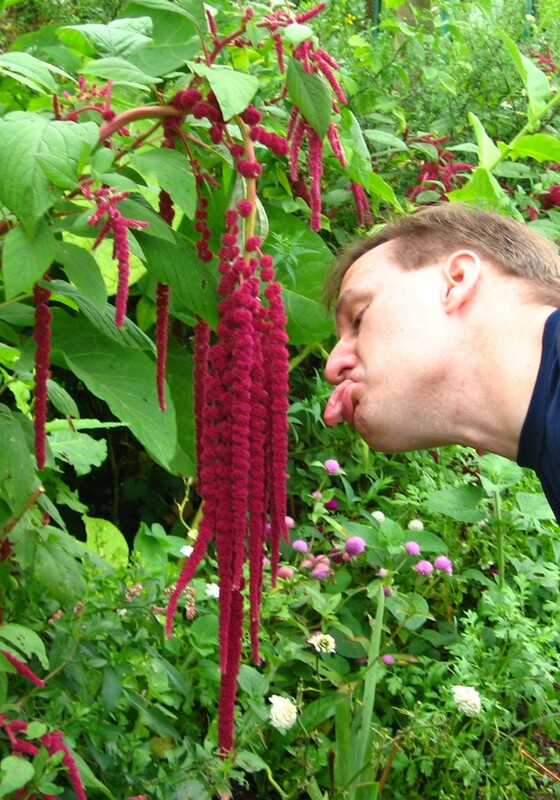 I tried growing some Amaranthus or commonly known as “love lies bleeding” this season, and it really surprised me. I have grown the smaller varieties in the past, like the pendulous variety which topped off at 3 to 4 feet tall. 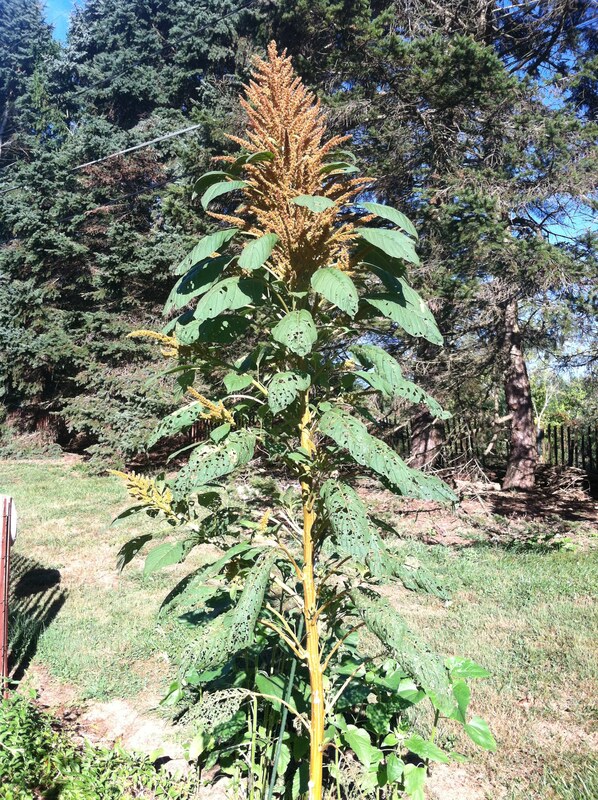 But the Giant Orange Amaranthus shot up 8 feet tall and then sent out this wonderful feathery plume that everybody who visits just stops and stares at! 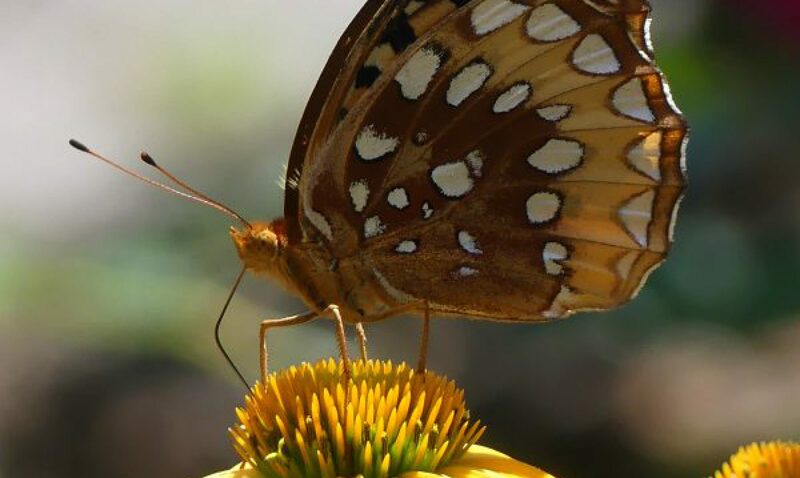 These flowers are not valuable as nectar sources for pollinators, but the seeds are a great nutrient packed source for humans. 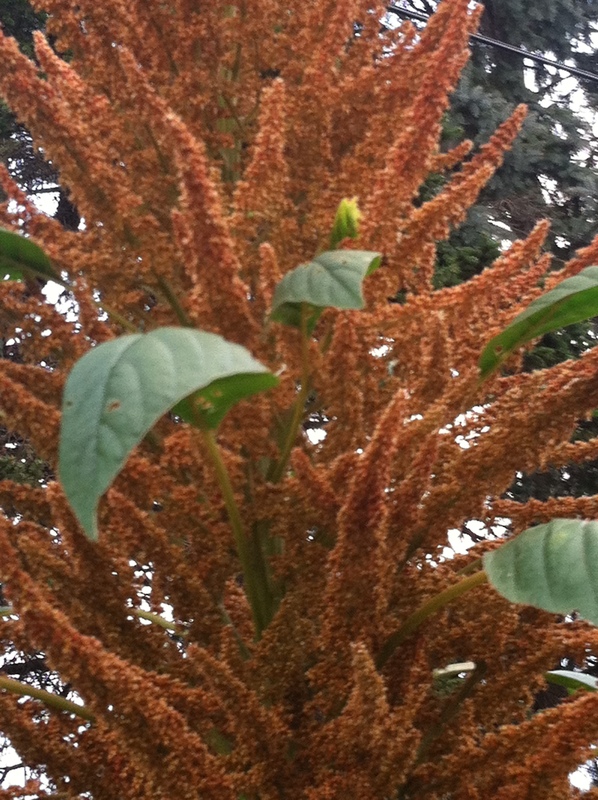 The Giant Orange Amaranthus towers over me! 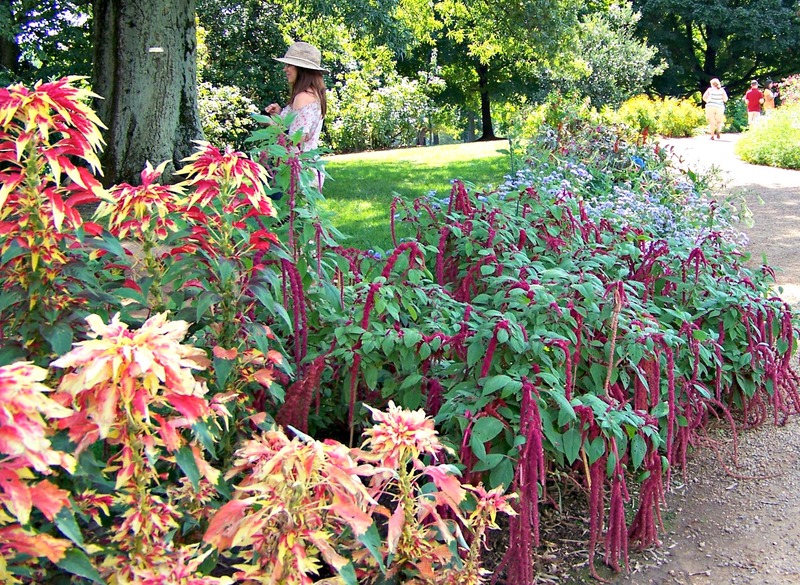 Grown for thousands of years, amaranthus has been called an”ancient grain” or “pseudo cereal“. The entire plant is edible, leaves, stalks, seeds, and flower, so it has been called “the wonder food plant“. The seeds can be popped like corn, roasted, stir fried, and sprinkled on cereal. The stems and leaves can be chopped and stir fried or eaten in salads. It is packed with protein, lysine, high in fiber, and supposed to lower cholesterol. It reminds me of chia seeds, another nutrient packed rice like grain. I love chia, so I was really interested in trying out amaranthus. But I wasn’t sure how to harvest it and after some trial and error figured it out. Watch my YouTube video on the process. 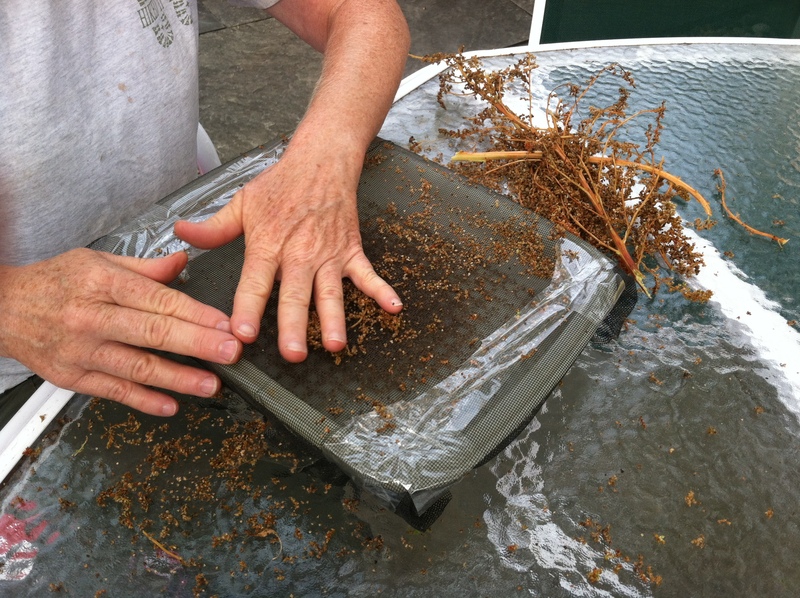 Basically, I set up a Tupperware container with a screen on top and rubbed the seeds through the screen into the container beneath. You are separating the seeds from the chaff, just like threshing wheat. In just 10 to 15 minutes, I harvested about a cup of the seeds ready to use in cooking. They taste good too! I will be growing more varieties next year for sure. Wow! That fascinates me. What areas will it grow in? I’ll watch the video to see where you get the seeds from the plant. It looks like somethings been eating the leaves.